If there’s one thing kids’ rooms have in common, it’s color. When I was in elementary school, I decided my favorite color was yellow. Thus, I simply needed yellow painted walls in my bedroom. And no, not a reasonably muted, pastel, or pale tone. I wanted to go all out. Canary yellow? Sunny yellow? It didn’t matter, as long as it was bright. My incredibly tolerant mother agreed that we could redecorate my room for my 10th birthday, and the walls have remained the same color ever since. These days, when I look for decorating inspiration, I sometimes find myself looking at pictures of kids’ rooms. Why? 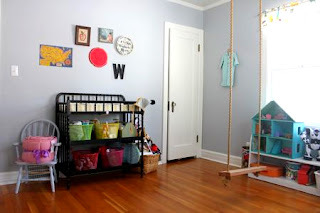 I’ll tell you: I like looking at cute playrooms because there are so many great D.I.Y. ideas! 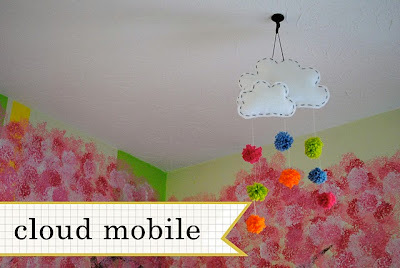 Like this cloud mobile from Crafted Love, which is absolutely darling and super easy to make. Getting some inspiration from children’s décor adds youthfulness and an element of fun to the mix. Dressing up commonplace appliances is also something kids’ rooms can get away with. 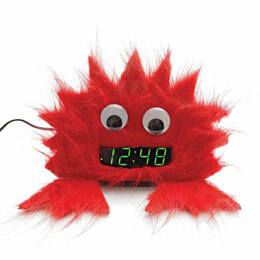 One example is this clock creature from Disney’s Family Fun website, made entirely from items like googley-eyes and felt that you can find at your local Beverly’s Fabric & Crafts store. Last (but not least), lighting is always important. Consider upcycling an ugly old light fixture (say, from a thrift store) into something bright and colorful! DIY Home Decorating Ideas has several before-and-after photographs to help inspire your crafty side. Also, be sure to take a look at the free home décor how-to’s and free kids craft how-to’s on beverlys.com for even more ideas and inspiration. Kids tend to be pretty “out there” with their personalities, so it makes sense as to why some children would be so certain of how they want their space to look. I mean, really, aren’t we all a little like that, even as adults? Maybe we’d skip the bright-yellow-bedroom-look, but we still like to make our space an expression of our personal taste. Got your own unique idea? Share it with us and our community in the comment space below or on the Beverly’s Fabric & Crafts Facebook page! We’d be happy to hear about your latest home décor project. These rooms are beautiful. Absolutely love the birdhouses! As an adult, I would happily have these above my bed. Thanks for the delightful inspiration. And for the mum of three, take a walk in the sunshine and relax. Thank you thank you thank you!!! After a fruitless hour browsing the net for kid’s room ideas… this is by far the best, so much inspiration!! Thanks for posting it – makes this tired parent very happy! Mike, so glad you were able to find inspiration here for your home! Good luck on your project and thanks so much for commenting!